Crews will visit each city neighborhood twice, once in November and again in December. 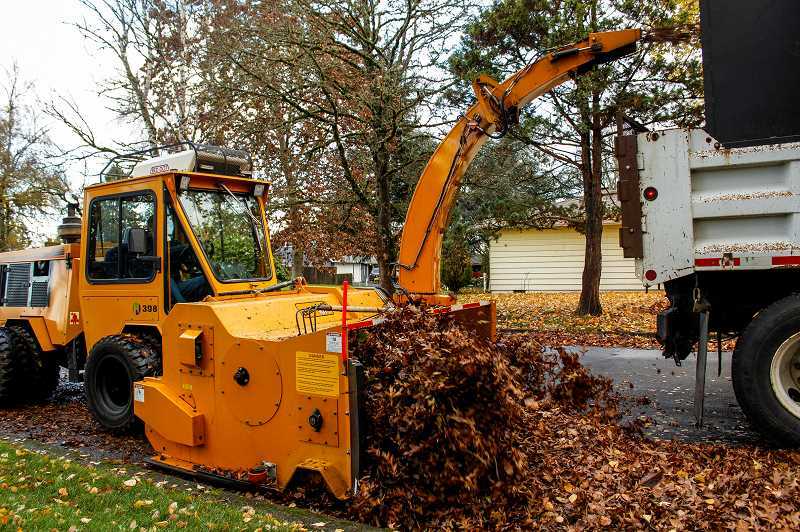 Hillsboro maintains more than 230 miles of streets, boulevards and roads and crews from the city's public works department plan to visit each and every one, collecting fallen leaves over the next two months. 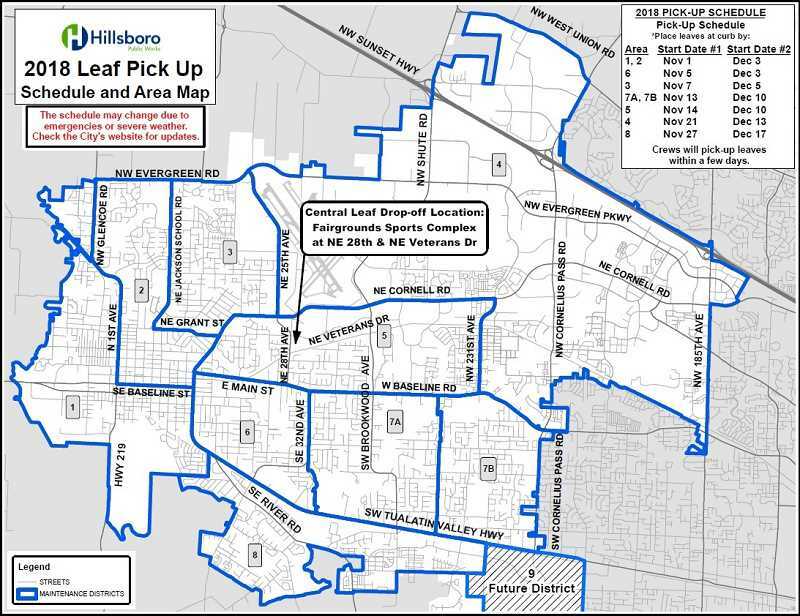 Starting Thursday, Nov. 1, crews will begin collecting fallen leaves that litter sidewalks, yards and streets across Hillsboro as part of the city's annual leaf disposal program. The annual pickups are aimed at reducing flooding, said city spokeswoman Lindsay Wochnick. Leaves easily clog storm drains and can cause a major mess during Oregon's traditionally wet autumns. "Working together, we can also keep debris from flowing downstream into water quality facilities, creeks and streams," Wochnick said. The program runs through Dec. 20. A schedule of pick-up dates is available online at Hillsboro-Oregon.gov/Leaf or by calling 503-615-6509. Copies of the map and schedule are also available at the Hillsboro Civic Center utility billing office, 150 E. Main St., or the city's Public Works facility, 4415 N.E. 30th Avenue. The city has been divided into eight districts to facilitate pickups, Wochnick said. In each district, leaves will be picked up once in November and again in December. Before pick-up crews arrive, residents are asked to rake loose street tree leaves into a long row, 18 inches from the curb to allow storm water to drain. These piles should be no more than 3-feet-tall, and should not block mailboxes, driveways, garbage collection areas or street intersections and cul-de-sacs, Wochnick said. If residents opt to bag loose leaves for pickup, they should be done in biodegradable paper bags. Plastic bags will not be accepted, nor will landscape debris from commercial enterprises. Wanting to dispose of your leaves early? Residents can drop off leaves at two events at the Fairground Sports Complex, near the intersection of Northeast 28th Avenue and Northeast Veterans Drive, on Nov. 10 and Dec. 15. These drop-off events are scheduled from 9:30 a.m. to 3:30 p.m.
During the two drop-off events, the city is asking residents to also drop off canned food for the Oregon Food Bank. For more information, visit Hillsboro-Oregon.gov/Leaf or call 503-615-6509.